Stainless steel Medical ID alert bracelet is great for men or women. It comes with a thick figaro chain. The Medical Id alert symbol is avaiable and several different colors and engraving is done on the back of the medical id plate in Bold Black laser engraving free of charge. The medical tag measures 1.75 x.75,polished front, brushed back, 6 lines od engraving, thick figaro chain. 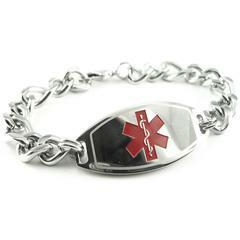 This medical id alert bracelet is available with different colored tags and chains also. Please enter your wrist size, measured snug.